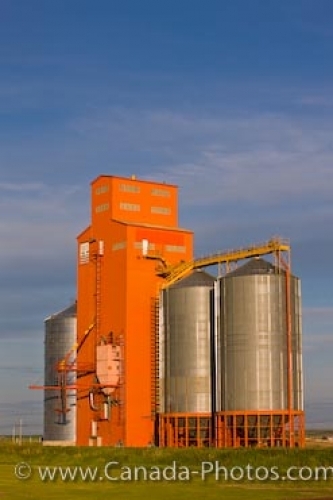 Tall cylinder shaped structures stand on either side of the brightly painted orange building at the modernized grain elevators plant in the town of Morse in Saskatchewan, Canada. In the orange building, the grain is cleaned, weighed and stored in preparation for shipping by rail car. From the train, the grain is transported to various Canadian ocean ports where ships deliver it to more than sixty countries. Saskatchewan is a major producer of grain and with the new cylinder typed structures, the process has become considerably faster. Grain Elevator in the town of Morse, Saskatchewan, Canada. Picture of the newer styled grain elevators in the town of Morse in Saskatchewan, Canada.